Marine Emission Control Systems Market size in 2017 was valued over USD 5 billion and the annual installation will surpass 6,000 units by 2024. Global marine emission control systems market will grow on account of stringent government norms and increasing maritime pollution. The IMO has introduced a norm with an aim to limit NOx emissions by diesel engines installed or built on & after 1st January 2016. The directive is applicable on all the vessels with a power output of > 130 kW. In addition, IMO in 2016, revised global limit on sulfur fuel content to 0.5% on the vessels built or installed on & after 1st January 2020. Strict norms under the MARPOL 73/78 Annex VI were introduced on the 1st of July 2010, leading to an increase in the adoption of Electrostatic Precipitators (ESPs). Rising environment and health concerns coupled with stringent norms in the ECAs will positively impact the product demand. Introduction of monetary penalties in case of non-compliance to the regulations is projected to boost the marine emission control systems market growth. Healthy orderbook, restructuring of the older vessels with an aim to build sustainable solutions and positive outlook toward the shipbuilding industry are few parameters propelling the product penetration. 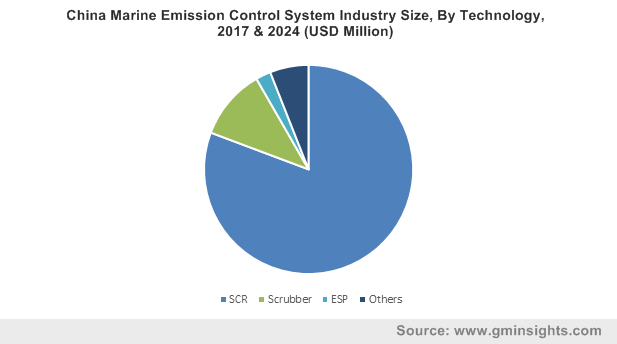 Scrubber marine emission control systems market will witness growth owing to less payback period along with long-term operational flexibility. Rising demand for hybrid systems owing to their greater flexibility and adjustability in varying water alkalinity will further drive the product adoption. ESP segment will grow owing to low energy consumption and cost efficiency. Recent improvements in the product features coupled with increasing R&D activities will positively impact the industry landscape. MDO marine emission control systems market in 2017 was valued over USD 4 billion. High sulfur content in heavy fuel along with stringent regulatory norms with an aim to limit PMs, nitrogen and sulfur emissions by marine industry will boost the product penetration. In addition, allowance of low cost fuel along with emission control systems to comply with the norms will complement the industry outlook. Hybrid fuel segment is set to grow owing to stringency in government norms and rising awareness toward advancement in emission control technology. In addition, growing global merchandise trade coupled with rising demand for bulk carriers and container vessels will complement the product deployment. Recreational marine emission control systems market is anticipated to grow owing to rising disposable income along with increasing demand for luxury & comfort. Ongoing R&D activities and rapid technology innovations to combat the cost pressure will propel the product deployment. Commercial applications accounted for over 45% of the global market share. Increasing cross border trade, long international voyage, and introduction of standards pertaining system construction, inspection, and operation will boost the product demand. In addition, rising health & environmental concerns coupled with increasing demand for sustainable systems will drive the business growth. 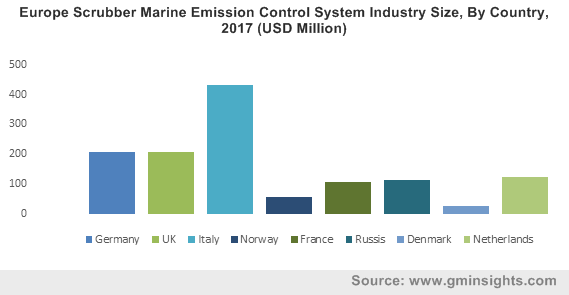 The U.S. marine emission control systems market is set to grow owing to stringency in emission control norms coupled with ongoing innovations and investments to manufacture sustainable systems. Implementation of strict government protocols and rise in shipbuilding activities pertaining to the growing demand for commercial vessels and battle forces will complement the industry outlook. MEPC in 2018, strategized to limit the emissions from the marine industry and reduce the levels by 50% by 2050. 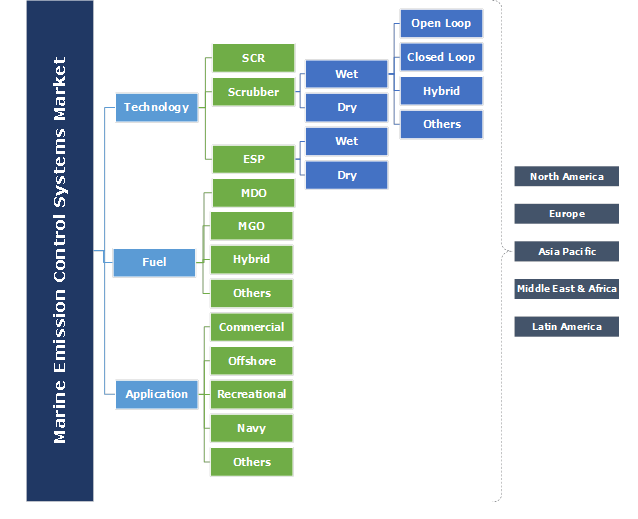 Major industry players across the marine emission control systems market includes Kwang sung, Yara, Mitsubishi, Wärtsilä, Hyundai Heavy Industries, Caterpillar, Hug Engineering, MAN Energy Solutions, Agriemach, Johnson Matthey, DCL International, Niigata Power System, Tenneco, ECOUREA, Hitachi Zosen, Ecospray, PANASIA, Ecospec, Danish Technology, ME Production, DEC Marine, H+H Engineering, Alfa Laval, Damen Shipyards, Hamon Research-Cottrell, CR Ocean Engineering, VDL AEC Maritime, Langh Tech, DuPont, Clean Marine, Shanghai Bluesoul, Fuji Electric, SAACKE GmbH, and Valmet. Product development, innovations R&D and collaborations to comply with the globally accepted norms and mandates is driving the market growth. The manufacturers are actively participating in partnerships and M&As with regional & global vendors to generate the opportunities. Emission control systems including SCR, scrubber and ESP are nitrogen, sulfur & particulate matter abatement technologies, respectively, deployed across engines & boilers to curtail the emissions. Growing demand for sustainable systems coupled with government initiatives will positively impact the industry growth.